Feel the evolution! 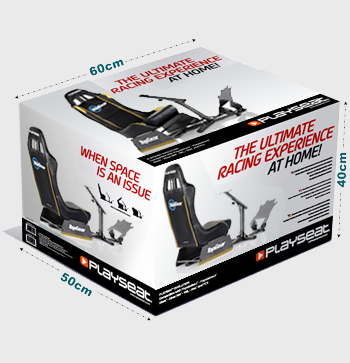 Take a seat and drive as fast as possible in the official licensed Playseat® Evolution Top Gear! This chair has been designed in cooperation with Top Gear, especially for all the fans of the immensely popular television series! Playseat® chairs are used by professional drivers to simulate races and to learn new tracks. The Playseat® Evolution Top Gear has a black frame and the seating is upholstered with high quality leather-look black vinyl. It can be used by adults and children, so all your friends and family members can enjoy this chair. This seat is very comfortable, stable and highly adjustable. Thanks to its unique foldable design, it uses little space when not in use, for easy storage and transport. Wow what a chair. This has transformed my gaming to another level, car racing games are so much better now. The chair is super easy to assemble and only took about 30 mins on my own. Everything is made to adjust to your needs with ease and its real comfortable, I even sit in it whilst playing non racing games. Build quality is great and you will instantly see that this will last you for years to come. The actuall seat is made from quality materials and it folds when not in use (which wont be often) so it can be stored easily. Overall I am mega happy with the chair and its easliy the best gaming accessory I have ever purchased. Perfect driving experience. I bought it for practicing purposes to master my real car. I almost feel the same with it. One thing you don't have is G.
The chair was easy to build, it was a bit confusing cos the number of srews seemed to be wrong, but the Support Team could help me quickly. I ve tried the chair with a Thrustmaster TX Wheel and ist pedals and it was easy to mount that. I had more Problems with the Fanatec pedals cos the mountingplate doesnt allow to Mount them in a way that the Wheel stand doesnt hide the break pedal. So for this pedals there is some Workaround needed. The main useage for me is with iRacing at the Moment. and it is great fun and an big improvement than having the Wheel mounted on the chair and sitting on a seat with roles on it. => 5 Stars for fun. 4 Stars for Comfort. cos the pillow you sit on is not perfect, i guess it depends on the right Placement of it. Finding the right distances for Wheel and pedals was not too hard and is easy to Change. Ok, the Playseat! I'm not sure where to even begin. The process of getting this chair and race setup has been long, extensive, but in the end the best thing Iv'e ever owned. It all started with the wheel of course, but knowing I wanted somewhere to mount it that wasn't a table or a desk. It works for awhile but i always craved that race seat experience. So it was off the the internet spending hours looking for a stand, chair, some way to have a cool, clean inviting rig that people would want to try regardless of age or gender. Weather they like cars or not. Somehow on a random afternoon I stumbled across the term Playseat. So I looked them up. I think I knew within the first few minutes that this was the chair for me. The Playseat Revolution! Wow that looks nice. I was sold! But then something caught my eye. No, it cant be? 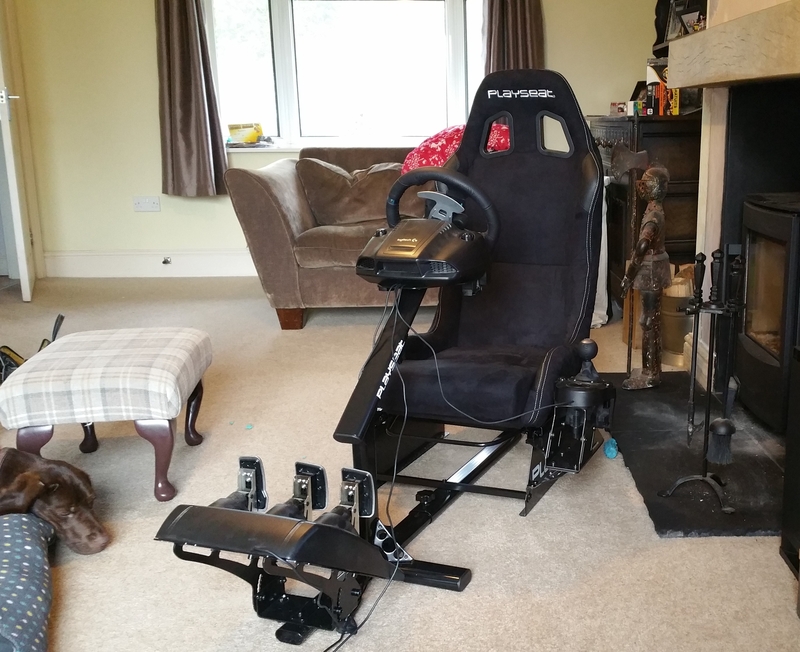 A Top Gear edition Playseat Revolution! Being a huge Top Gear fan I couldn't help myself. I drooled over this chair for weeks, Finally clicking the add to cart button was quite a moment! However It just got better from there. Lets start right from the top with the price. It is not a small amount of money, but when you want the best of something and you want it built to last. You get what you pay for! Playseat exceeded my expectations to say the least. You can just tell by holding each piece how much time, testing, reserch, commitment and love they have put into making the best chair they can make. Not only does it function beautifully it looks even better. I have a huge amount of respect for everyone at Playseat just making a great product without cutting corners or trying to build it down to some magic low price. I want quality and they have it! The delivery from the Netherlands to the United States was brilliant, Of all the stuff I have ordered over the years the last thing I expect is to get my Playseat a day early, early! I love you guys. I scooped it up went inside and had a blast putting it together. Taking out each piece, the nice powder coated metal brackets, even the hardware looks nice. Directions were very clear and easy to read, no missing parts, nicely wrapped. Smooth as could be. I was really impressed with the fact that there are a number of wheels and pedals out the there but Playseat has got you covered no matter what your using. That had to take some coordination with all these companies to be able to promise you the customer that no matter what you have, you can use it on this chair. Obviously my setup bolted on perfectly with the hardware Playseat provides for you. The last bolt is tight, I back away to take it all in. It is fantastic! the weeks of waiting and wondering all come down to right now. It is solid, sturdy, built to last, looks incredible. Everyone that comes over ends up loving the experience and cant wait to come back and have another go. I love walking by everyday and seeing the Playseat and it just begs to be played. Iv'e sat here now in closing struggling to think of anything from the start that i don't like about this chair or Playseat in general. Iv'e got nothing, I really just couldn't be happier with how this all turned out They have taken care of me, so the least I can do is share my experience, raise a glass to Playseat and thank them for doing what they do! I've been playing with this chair for the last few weeks and it is awesome! It goes well with my Thrustmaster setup. There are just a few updates that should be done to the chair which would make me give this a solid 5 star rating. 1. There is a support bar that goes vertically across the chair that can be felt when playing. It is especially noticeable when you've been playing for a while and you go to step on the brakes really hard. This bar starts to dig into the center of your back and can make it a little bit uncomfortable. I think if they had padding installed on it you wouldn't even notice it was there. 2. There should be a way to adjust the angle of the chair. I would prefer to have the chair tilted a little more upright instead of the default angle. Not sure if there is a way to change this or not. If there is, I haven't found it yet. 3. The pedals usually like to flex left and right when playing. I don't think the base is wide enough to support the pedals from moving and wobbling. This could be because I have my chair setup in a room with carpet so it isn't as solid. I might get some type of board or hard wood to place underneath the entire chair system to give it the support it needs to prevent the wiggling. 4. The mounting holes for the pedals do not line up well with the Thrustmaster Pro pedals. I was only able to get two of the screw holes to line up which doesn't provide the best mount. I'm tempted to drill 2 more holes into the pedal mounting frame so I can attach the pedals better to the frame. 5. There isn't a way to adjust the steering wheel straight up and down, if you adjust it, it will be adjusted both closer to you and higher. Luckily the height is perfect for me but if I wanted the wheel any higher I wouldn't be able to adjust it because I have the wheel base as close to the pedals as it will go. I know I've been really critical with this review but even with all of these suggestions I would still highly recommend this chair setup to anyone wanting an awesome racing chair. I can't wait to see how awesome this chair will be after they address these few design improvements. Thanks Playseat! My TopGear chair arrived Friday and I have been playing Driveclub all weekend! It’s amazing to sit in such an amazing chair when playing racing games and the chair looks awesome with the TopGear logo, The Stig and the checkered lines. I can fully adjust the chair to the perfect racing settings for me and the seat slider also works nicely. It’s definitely worth every penny. In this chair I feel like The Stig!